The Lornesleigh Legacy is the first book by Kay Bell, an Australian author who resides in Victoria. Set in Australia during the time of convict settlement, the gold rush, the boom years and the depression of the 1930’s, The Lornesleigh Legacy takes the reader on a journey of love, loss and life as it use to be. The Lornesleigh Legacy is focused around Will, a young boy living on a cattle station in North Queensland and John Clark, Will’s grandfather. Poppy John, as he is known to his family, is a well respected man and the patriarch of the family empire. With the family falling apart and Will suffering an injury, Poppy John takes Will away to recuperate. It is here that the reader begins their journey of time travel as Poppy John shares his secret box of treasures from the past with Will. The Lornesleigh Legacy surprised me. I found way more than I thought I would. I soon became attached to the 90 year old man and this boy who deserved more love and respect than his parents seemed to offer. Kay Bell writes with eloquence and grace as she captures the time and place in history that we can only imagine and read in books. Through her writing she is able to give the readers a clear visual of each scene, allowing them to imagine the sights, smells and emotions of the characters. I loved everything about this book. Although fiction I was enveloped in history and the love between Poppy John and Will. I angered at the treatment of Will by his mother and the weak role his father seemed to play. I rode the tidal wave of the family bickering and division. As Poppy John aged through the years of his life I felt his love and his loss. I gasped in places and I shouted no. I turned each page awaiting the next part of the journey as the years in Poppy John’s life diminished, not wanting this man to leave yet knowing his time was limited. I lived in hope that the end of the book did not see the end of this old man, feeling Will’s heartbreak before I knew the outcome. 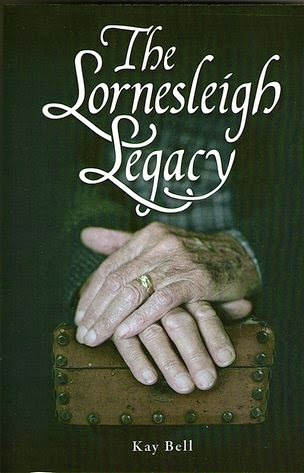 I read The Lornesleigh Legacy in ebook format which I purchased from Amazon.com. This has left me a little disappointed as it is one of those books I would love to have displayed in paperback on my shelf having the opportunity to discuss and share it with others. I can only imagine what it would feel like to hold a little bit of Poppy John’s life in my hands. I imagine it would feel soft, gentle, alive and full of the love of an old man who lived his life. The Lornesleigh Legacy has left me hoping we will see more from author Kay Bell. I await to see if we are given the opportunity to follow the continued journey of Will’s life in a sequel.